AsHumor Abusecloses in on its final performance this weekend, A.C.T. Publications Manager Dan Rubin reflects on what he learned while researching the history of San Francisco's beloved Pickle Family Circus. Rubin interviewed several members of star Lorenzo Pisoni's multitalented family for the latest edition of Words on Plays, A.C.T. 's behind-the-scenes theater guide. Click here to order a print or electronic copy, which includes 16 of Pickle photographer Terry Lorant's dazzling photographs of the Pickle Family Circus in its heyday. Lorenzo Pisoni's parents, Pickle cofounders Larry Pisoni and Peggy Snider, juggle in the Pickle Family Circus. Our coverage of the 2012 Sky Festival concludes with musings from other members of the A.C.T. Master of Fine Arts Program class of 2014, who experienced this intense two-week period of rehearsal and performance for the first time. The festival brings together A.C.T. students, staff, and faculty in the high-speed creation of inventive new work. For many students, the festival also offered an opportunity to delve into something new, as they stepped into roles as writer and director. Busbee and Aaron Moreland. Photo by Kevin Berne. This year, one productionThieves, a raucous spin on Shakespeare's Henry IV, Parts 1 and 2—will be presented as a full production at The Costume Shop. In celebration of our upcoming production of Humor Abuse, share your favorite Pickle Family Circus memories for a chance to win a VIP package to the show and meet star Lorenzo Pisoni in person. Entries must be submitted by January 22. Click here for details. 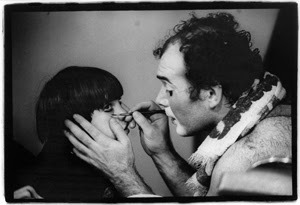 Pickle Family Circus cofounder Larry Pisoni applies stage makeup to his son, Lorenzo. Photo by Terry Lorant.